A smaller-than-standard Bain circuit with the fresh gas delivery tube inside the reservoir/waste gas tube. The fresh gas delivery tube is 1/16" ID, the containment/reservoir tube is 1/4" ID with the nose end flared to create an anesthesia facemask. 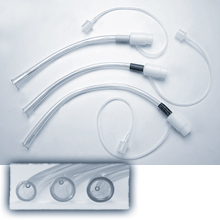 Connects to standard 19mm and 22mm evacuation tubing.